This article was written by Matt Staggs and originally appeared on Unbound Worlds. Welcome to another installment of Two Book Tango: an ongoing series in which Unbound Worlds pairs two titles that go well together. 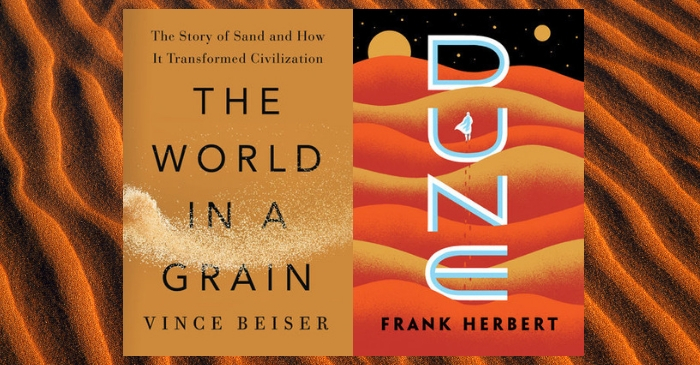 Today’s pairing is Vince Beiser’s The World in a Grain: The Story of Sand and How it Transformed Civilization, and Frank Herbert’s Dune. If you’re like me, the only time you probably think about sand is when you’re sinking your toes into it at the beach in summer, or maybe changing your kitty’s litter box. As it turns out, both of us should be thinking about it a whole lot more. According to Vince Beiser, author of The World in a Grain, we’re running out of it, and that could mean a lot of trouble in the very near future. We take sand for granted. Many of the fundamentals of human civilization were only made possible by sand: mining, building our cities, paving our roads, and more. Not much has changed today. We use more of it than any other natural resource. It is in our electronics, our optics, our windows … there’s almost as many uses for sand as there are grains of it on a beach. There’s different varieties of it, and, like oil, diamond, and precious metals, high value sand isn’t distributed evenly. The more useful it is, the harder it is to get, and good sand can bring a pretty penny. Sand is big business: People lie, steal, and kill for it all the time. Pirates and bandits, corporations and entrepreneurs, everyone is getting in on the sand game. The big money isn’t just in supplying the stuff for high end electronics manufacturers and construction firms, either. The rising waters of climate change are slowly eating away some of your favorite beaches (maybe even the one we mentioned above! ), impacting local tourism as vacationers choose to spend their time and money elsewhere. The services of engineering firms specializing in beach restoration have proven popular, but such efforts are only a temporary stopgap. Inevitably, erosion continues, and with it, the renewed call for more sand. Oddly enough, the issues explored in World in a Grain have something in common with Frank Herbert’s science fiction classic, Dune. Herbert, who worked as a journalist for a time, was inspired to write the novel after researching erosion in the sand dunes of of Florence, Oregon for an article. Sand may be getting hard to come by on Planet Earth, but not so on Arrakis, the parched, desert world of Frank Herbert’s Dune series. Still, it’s just as important, because that’s the native habitat of the planet’s sandworms: thousand-foot-long razor-toothed worm-like monsters that produce spice, or “melange.” Spice is an addictive substance with many properties, among them the awakening and cultivation of psychic abilities. The use of these abilities are what makes interstellar travel in Dune’s galaxy-spanning setting possible, so melange, much like our own sand, is part of the bedrock of civilization. The massive worms are considered sacred creatures by the Fremen, a nomadic people descended from spacefaring religious pilgrims who arrived on the planet generations ago. It is the Fremen who have made Arrakis habitable for human beings by building water reservoirs and canals, and they know the ins and outs of their desert home intimately — especially the potential dangers posed by the sandworms. The creatures don’t make a habit of hunting beings, but the vibrations caused by human footsteps and machinery used to extract melange sometimes trick the worms into breaching the surface in search of other sorts of prey. The Fremen aren’t the only inhabitants of Arrakis. The planet is under the stewardship of the House Atreides, a noble family tasked by their emperor with producing spice in the quantities needed to power a massive, star-faring civilization. It’s not a great position to be in. The Atreides must please their emperor, and maintain good relations with the Fremen, while being ever wary of plots concocted by the other royal Houses. If you haven’t read Dune yet, you’re in for a treat. It’s one of the genre’s great works of world-building, offering readers a complex saga of politics, resources, and, family. Forgetting it will be almost as impossible as getting sand out of your swimsuit. After water and air, sand is the natural resource that we consume more than any other–even more than oil. Every concrete building and paved road on Earth, every computer screen and silicon chip, is made from sand. From Egypt’s pyramids to the Hubble telescope, from the world’s tallest skyscraper to the sidewalk below it, from Chartres’ stained-glass windows to your iPhone, sand shelters us, empowers us, engages us, and inspires us. It’s the ingredient that makes possible our cities, our science, our lives–and our future. And, incredibly, we’re running out of it. The World in a Grain is the compelling true story of the hugely important and diminishing natural resource that grows more essential every day, and of the people who mine it, sell it, build with it–and sometimes, even kill for it. It’s also a provocative examination of the serious human and environmental costs incurred by our dependence on sand, which has received little public attention. Not all sand is created equal: Some of the easiest sand to get to is the least useful. Award-winning journalist Vince Beiser delves deep into this world, taking readers on a journey across the globe, from the United States to remote corners of India, China, and Dubai to explain why sand is so crucial to modern life. Along the way, readers encounter world-changing innovators, island-building entrepreneurs, desert fighters, and murderous sand pirates. The result is an entertaining and eye-opening work, one that is both unexpected and involving, rippling with fascinating detail and filled with surprising characters. Frank Herbert’s classic masterpiece—a triumph of the imagination and one of the bestselling science fiction novels of all time. Set on the desert planet Arrakis, Dune is the story of the boy Paul Atreides—who would become known as Muad’Dib—and of a great family’s ambition to bring to fruition humankind’s most ancient and unattainable dream. A stunning blend of adventure and mysticism, environmentalism and politics, Dune won the first Nebula Award, shared the Hugo Award, and formed the basis of what is undoubtedly the grandest epic in science fiction.